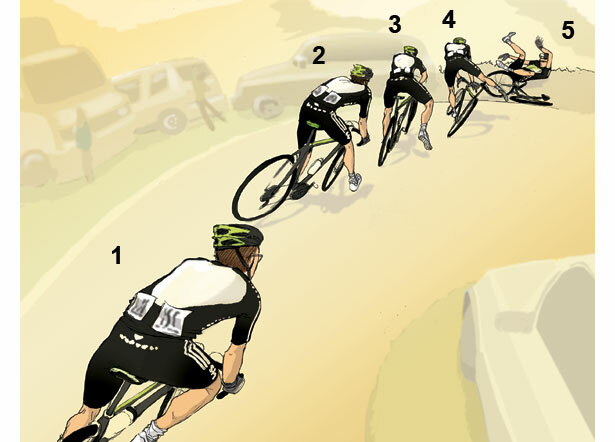 How to crash right, as demonstrated by a pro. If you were watching Stage 12 of the Tour, you saw Team Sky racer Geraint Thomas go down while descending on a wet, oily mountain road in the Pyrenees. But he crashed about as smoothly and softly as was possible in that case, winding up rolling in the grass instead of post-holing the pavement. Here’s a breakdown of what he did, and what you can learn from it. Thomas had his elbows bent and head up, looking through the corner. The inside knee was pointed into the turn and he pressed down on the inside of the handlebar and put his weight on the outside pedal, which he kept down. The bike leaned underneath him, but his body remained straight. It’s a common misconception that you lean with the bike, but in fact it’s important to keep your weight over the tires, so that if they start to slide, they’re still underneath you–the bike doesn’t skip away and leave you cantilevered over nothing. At this point, he had scrubbed a lot of speed. But he didn’t have the benefit of a long runout; the hillside dropped away dramatically after he shot the gap between two cars. So the safest thing to do was to dump the bike in as controlled a fashion as possible.